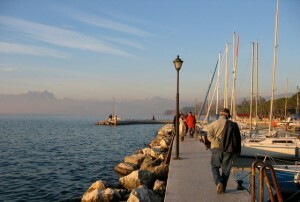 The lovely village of Bardolino lies along the shores of Lake Garda in a stunning area of Italy only 130 km from Venice. The lake is famous not only for its spectacular natural scenery but also for its cuisine—and of course for its wines. The most special of these is the eponymous Bardolino, a light, friendly red with a mouthful of fruit and spices. This wine was the star of a big tasting hosted recently in the splendid and historic Dogana Veneta (Veneto Customs House) overlooking the idyllic harbor of Lazise on the Veronese shore of Lake Garda. The occasion marked the launch of the 2009 vintage of red Bardolino and its pink cousin, both sparkling and still, Bardolino Chiaretto. The day attracted over 5,000 visitors, and they were able to meet almost all of Bardolino’s producers. Organized by the Bardolino Producers’ Consortium, with the support of the Municipality of Lazise and the agricultural department of the Province of Verona, the event presented the latest vintage to wine lovers and media, including bloggers, wine journalists, and wine critics. Over a hundred wines were available for tasting, almost equally divided between reds and Chiaretto rosés. The Lake Garda viticultural region has more than 2,700 hectares in production. There are fourteen different communes and twelve different soil types—a very complex region. Bardolino wine is made with corvina, rondinella, corvinone, and molinara grapes, the same as those in its cousin—and neighbor—Valpolicella. But the vineyard soils in Bardolino are quite different from those in Valpolicella. Here, glacial soils with stony sub-soils and a high percentage of limestone combine with a mild microclimate to produce lively fruit flavors with good acidity and low levels of alcohol. Bardolino has suffered in last ten years, perhaps a victim of the trend favoring concentrated, heavily extracted, high-alcohol wines. But now finally, after years of neglect and market difficulties, Bardolino and Bardolino Chiaretto seem to be enjoying renewed popularity. 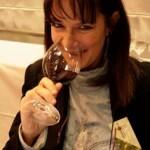 Despite the worldwide economic crisis, in 2009 wines from Bardolino DOC have enjoyed record sales. Below I’ve selected four wines that are real standouts—two each of Bardolino and Bardolino Chiaretto. Enjoy! This wine is a light ruby red color with fine red fruit and fresh aromas of flowers and grass. It’s dry, well balanced, smooth, and fruity with a pleasant finish. Bright red in the glass, with the scent of ripe red fruit—cherries and strawberries—plus a touch of cinnamon and black pepper. On the palate the wine is elegant, fruity, and savory, with great Bardolino typicity. Very drinkable! This sparkling wine made with the Charmat method is a brilliant rose pink. Its scent is very floral, fresh and a little sweet with a nuance of citrus. The taste is perhaps a little elusive, but fruity and delightful. This wine is made from rondinella, corvine, and rossignola grapes (rossignola is another grape native to Verona). This sparkler is made using the Méthode Champenoise, the second fermentation occurring in bottle rather than in a tank as in the Charmat method. The wine is a beautiful peachy pink color and offers the scent of chamomile flowers, grasses in a flowery meadow, and yellow fruits like golden apples. The taste is a bit darker, though, but it’s still quite silky with the nuance of citrus. Continua con reciprica soddisfazione la collaborazione con l’ Online Wine magazine di David Honig…….